Happy Monday, and happy Shark Week! Shark Week reminds me of my senior year of college when John and I were dating... in East Lansing eating pizza, playing Scrabble, and watching Shark Week! John later admitted he isn't a fan of Shark Week, but it still holds a special place in my heart, ha! It was a beautiful day in Flagstaff with 0% chance of rain (famous last words...). The hike was absolutely beautiful and there were wildflowers everywhere. About half way up the mountain we started hearing thunder and started to get concerned about lightning and getting stuck in the rain. We decided to stop and eat some lunch and see if the storm would pass. The thunder was pretty consistent so we decided (very begrudgingly) that it would be best to turn around. It was a very good thing that we turned around when we did because it started pouring rain. I didn't bring my rain jacket, so John gave me his... this helped for a while, but eventually it started to hail! It was a little bit of a nightmare and the path turned pretty much into a downward flowing stream. Poor Scout was soaked! 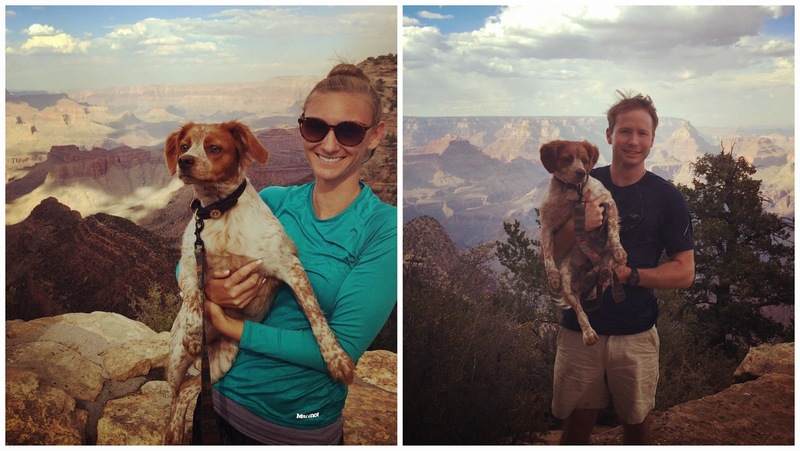 When we finally got back to the trail head, we decided we should swing by the Grand Canyon (...said no one ever). The Grand Canyon is a little over an hour from Flagstaff, so we figured we would be spontaneous and go check it out! Since we only had a few hours, we drove part of the South Rim to several lookout points. It was my first time, and it was absolutely beautiful. We bought a year pass and plan to go camping at the North Rim in a few weeks. I can't put into words how big and breathtaking it was... and pictures certainly do not do it any justice! The Grand Canyon is the second national park that I've been to (Carlsbad Caverns was the first), and it is such a humbling reminder of our God's artistry. On our drive home, we came across several elk... one of which was eating right near the road, and he didn't seem to be spooked by people or cars! Seeing so many elk was a little bit concerning, because my last trip to a national park ended by hitting two coyotes - and we certainly didn't feel like having to pay for damage from an elk! The sunset was beautiful, and the moon was beyond bright... it was a wonderful Saturday. And we pretty much lounged all Sunday since we were so zonked! 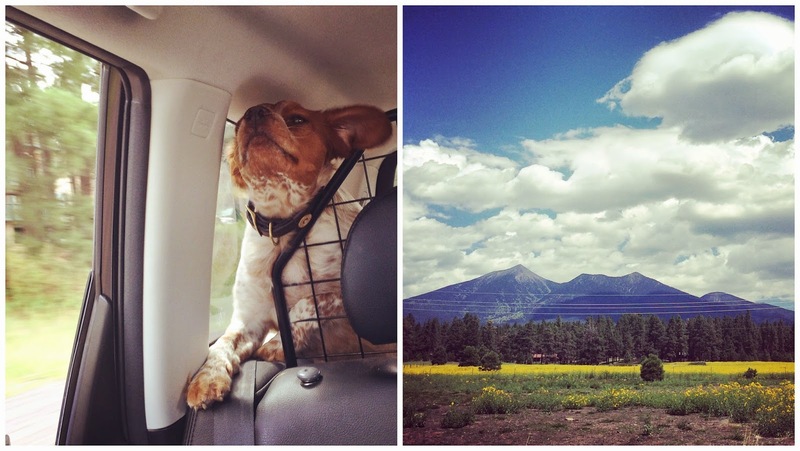 Haha the picture of Scout in the car is cute! Looks like a great weekend :) happy Monday! The Grand Canyon is so gorgeous - can't wait to hear about your camping trip! Omg! I'm dying to see the Grand Canyon! You are so lucky that you can visit it often! What stunning photographs! Even with all that rain-- glad you guys didn't get stuck in any kind of storms, and I love that picture of you all zipped up in your rain coat! I've never seen the grand canyon. PS I heart scout! Your dogs facial expressions are too cute!!! I would love to see the Grand Canyon! Looks like a fun weekend of adventure! I am sure Scout slept like a baby after all that! Happy Monday girl! What an adventure! I want to make it to the Grand Canyon some day, it looks absolutely beautiful, for now I will live through your pictures! What a fun adventure! I was so sad we never made it to the Grand Canyon when we lived in Arizona! Guess I will just have to come back! What a beautiful trip!! 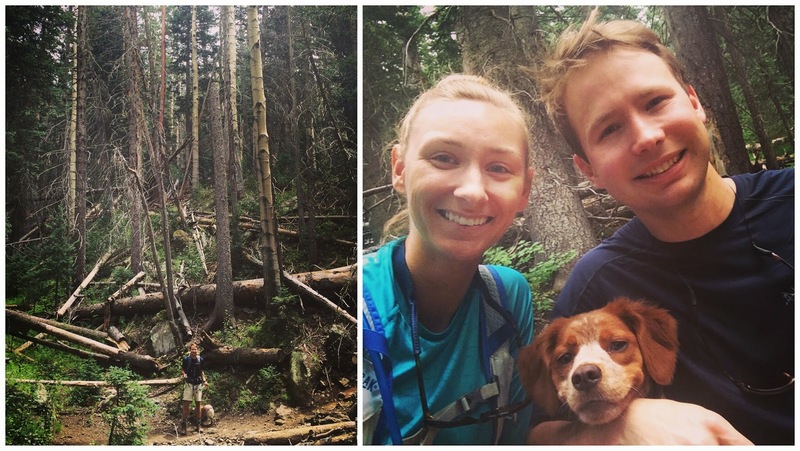 I can't imagine how amazing the hike was...and your pup looked pretty happy!! that's on my bucket list to see. We flew over it going to Vegas & the view from above was amazing. I want to get down into it someday! Such a fun adventure! Pictures looked gorgeous! Looks like you had a jam packed day of fun! 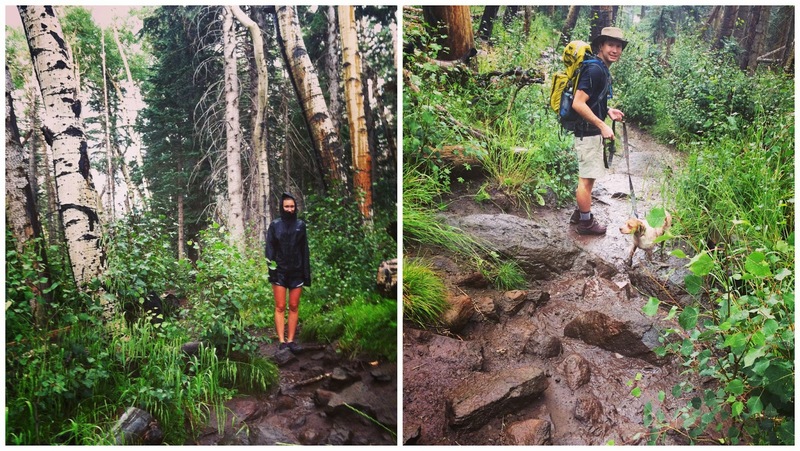 I've totally gotten stuck in a rain/hail storm hiking and we ended up running back down the trail. lol. It was kind of fun though. I want to go back to the Grand Canyon someday. That's awesome that you are so close! Love the puppy pictures! The Grand Canyon is definitely on my bucket list (thank goodness for the panorama setting on iPhone too ha). I would love to read your dogs blog! ;-) looks like you guys had an amazing weekend!! I went to the Grand Canyon at 15 and hated it because I didn't want to be on vacation with my parents. I'd love to go back so that I can truly appreciate it! So beautiful! Glad you guys are doing lots of exploring! Gorgeous! I would love to get there. Sounds like you guys had some great quality time together this weekend. those views are so freaking breathtaking! i'm so glad you shared this! Oh my those Grand Canyon photographs are stunning, really makes you appreciate the world around you then you find the beautiful places of the world. I would love to see it myself one day. 1) Scout is seriously the most adorable pup around! 2) Love that ya'll stopped to take pictures of each other in the pouring rain. ha! 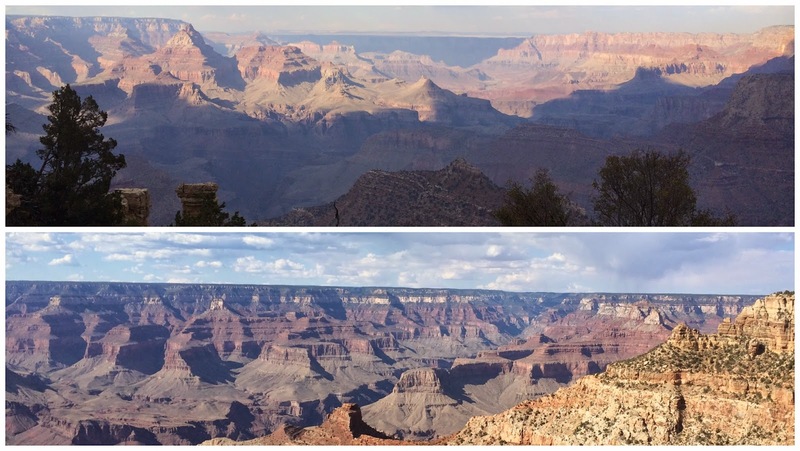 3) You have to pay to see the Grand Canyon? 4) I've never been to the Grand Canyon (obvi) but isn't it both mind blowing and equally peaceful seeing His natural creations in person? Gorgeous! That area is one of our favorite places! WOW your photos are amazing!!! 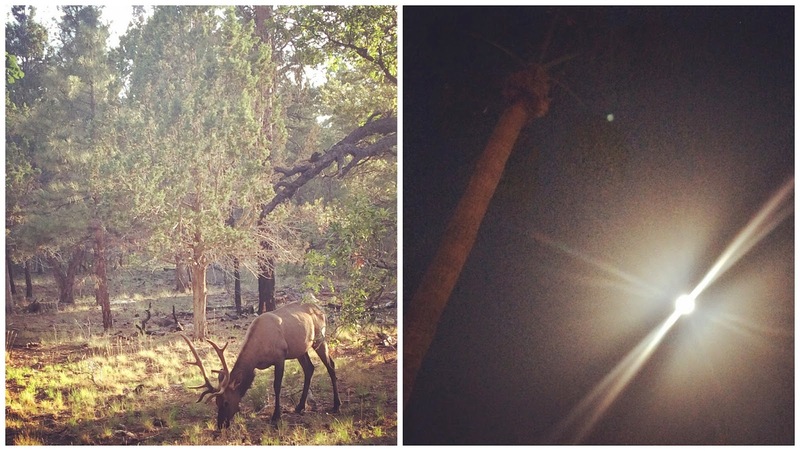 And can I just say I'm so very jealous of your Arizona adventures?! I'd looove to live somewhere where I could just go on a weekend hike! Beautiful photos, Lisa! I just love the Grand Canyon. I can't believe it started to hail on y'all! One of my favorite drives in the country is the drive from Flagstaff to Sedona through Oak Creek Canyon. Have y'all done that yet?? What a great weekend outdoors! What did Scout think of the hail? Seeing the Grand Canyon is definitely on my bucket list and I'm a little jealous you live so close to it! I've always wanted to go to the Grand Canyon! It's so beautiful!